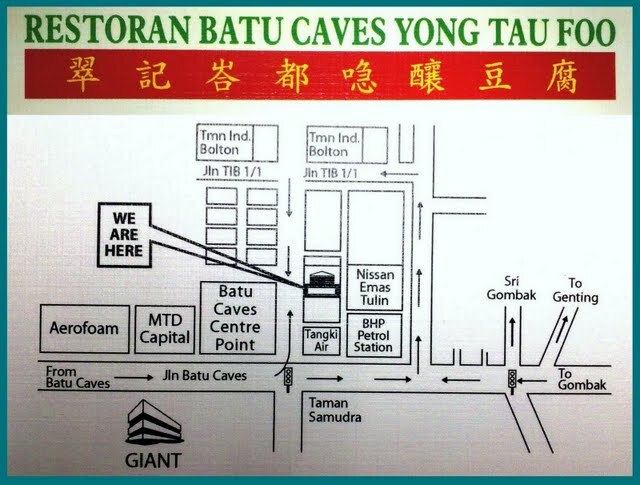 controlling-pollution: Restaurant Batu Caves Yong Tau Foo: Mother-in-Law Knows Best? Restaurant Batu Caves Yong Tau Foo: Mother-in-Law Knows Best? Our latest food expedition led us to Batu Caves area where a chef friend of ours took us to enjoy simple homemade Yong Tau Foo (YTF) during lunch time on a lovely Sunday. We all know that this noble fare maybe basic but it still takes good skills and quality to produce a good one! Restaurant Batu Caves YTF certainly lacks in décor but the restaurant has a neat and clean environment al fresco. I was there after the lunch crowd but I still notice people trickling in slowly in small groups. As usual, with me being a nosy one, I ask the owner if I can see him in action… and just in time as he was frying up a lovely golden batch of nicely rolled beancurd sheet roll. The kitchen was open and one can see clearly on what the staff and owner was doing which I think is a good thing. It was clean and neat and I think that this is a good way to reassure customers on what they are eating! The owner also has a secret recipe for his homemade sauce. I usually don’t really care for the brown sauce served in most YTF stalls but I have to say I like this one! Nice balance of savory flavors and when combined with their homemade chili, it was a fantastic accompaniment for the YTF. First up, our Fried Shui Gow (RM1 per piece) was served fresh and hot and was nicely crisp. Lovely and with a bite, the stuffings were yummy. The owner had used a good quality of pure fish paste which he meticulously remove from fresh fish and mixed till a bouncy texture has been achieved. One piece is Not enough for me… I had 4 pieces as we reordered more after we finished our first order! Fried Fu Chuk (RM 1 per piece) was super crispy as well with a thin layer of fish pasted encased. I like the fact that their bean curd roll was well fried evenly on low fire to crisp up the roll. Our Soup Shui Gow (RM1 per piece) arrived and it was decent. I wish there was more stuffing to the dumplings but still it was enjoyable. The soup broth was light and not laden with msg as I didn’t feel thirsty after enjoying it. We were recommended by the owner to try his Asam Kembung Fish (RM7 per fish) as he got a really good batch of fresh ones in that day. Truly enough, the fish was really fresh and the asam sauce that was cooked with it had a good balance of sourness and thickness to it. The gravy was good with white rice and as usual, the sourness pulls me into flooding my rice with the gravy. Simple Blanched Kai Lan with Oyster Sauce (RM5 small portion) was average and provided our green vitamins for the meal. What was surprising was Acar Tau Pok (RM5 small portion), which consisted of a lovely pickled vegetable covering crispy fried cubes of bean curd puffs. The dish was simple but unexpected and I enjoyed it tremendously with the crushed peanuts and crunchy red onions. It was quite addictive and I find myself enjoying it more as the flavors of savory, sweet and sour lingers in my mouth. After our meal, the owner chat a bit with us and I found out that there is another outlet nearby also owned by the family members. He proudly told us that the recipe for the YTF was handed down by his mother-in-law and cheerfully informed us that she has retired and the rest of the family are running the business now. I like this place for its unpretentious food! No frills but I could tell that the owner was genuinely sincere and proud of his food. It really takes passion to produce good food and this one certainly reflects it. Owner kept emphasizing that quality is his secret recipe to a good YTF. I agree with him. With passion and quality, food genuinely tastes homemade with love!